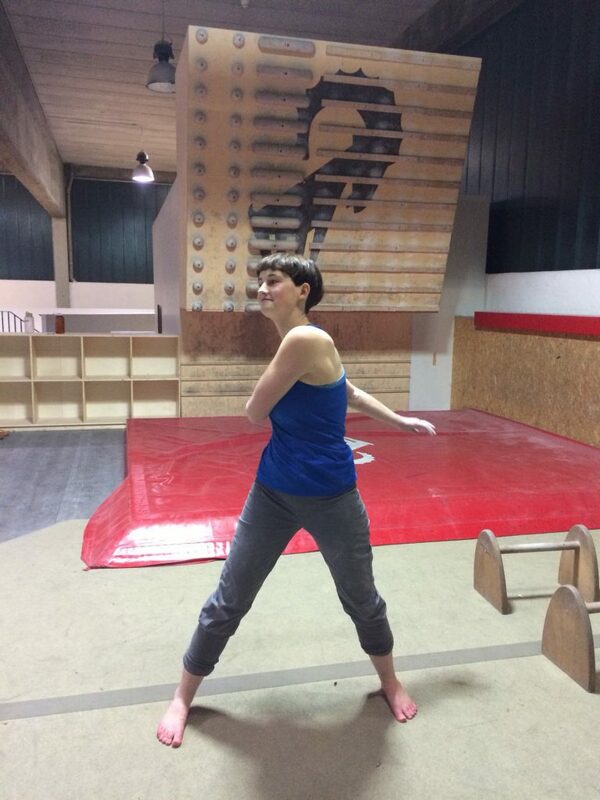 "Warming up before bouldering? Can’t I just start with easy bouldering problems instead?" That used to be my attitude. Simply because I found warming up kind of tedious. I wanted to get started right away. That changed when I realized something that reshaped the entire bouldering and climbing experience for me. No question, getting started right away works. Some relaxed beginner bouldering and routes when climbing also get the body going and prepare it for the upcoming movements. For some climbers, this happens faster than for others. I belong to the second type. It always took a bit longer for me. But it worked just fine. We tend not to question the things that work "just fine." We continue doing what we’re familiar with. A typical human tendency, and there’s nothing wrong with it. But there are techniques that work better without us knowing it. In my case, I didn’t discover this until I regularly went bouldering in the evening and would often already be tired – especially during the winter. "How am I supposed to boulder like this?!?" Really, I’d much rather be sitting on my couch watching TV. If I had a TV, that is. Take in the entertainment. Relax. Frequently having these energy lows was annoying. If Carlos and I hadn’t made this bouldering routine a fixed part of our day, I’m sure I would’ve given in to my inner couch potato. In hindsight, however, it was exactly what ended up helping me get more out of bouldering. I noticed that simply starting with small bouldering tasks didn’t get me to where I could master difficult problems. And if there’s one thing that bothers me, it’s taking on mediocre climbing problems with a mediocre energy level even though I know I can do much better. Not to say there’s anything wrong with simple problems and bouldering just for fun. I like these, too, and prefer to do them when I’ve already exerted myself and want to do something before calling it quits. What’s changed by warming up before bouldering? My whole body was activated, so I could use it better from the start. Even before bouldering, I was in a mental state that helped me focus and give 100% right away. I decreased the time I needed to spend on easy bouldering problems and could move on to problems that tested my limits more quickly. 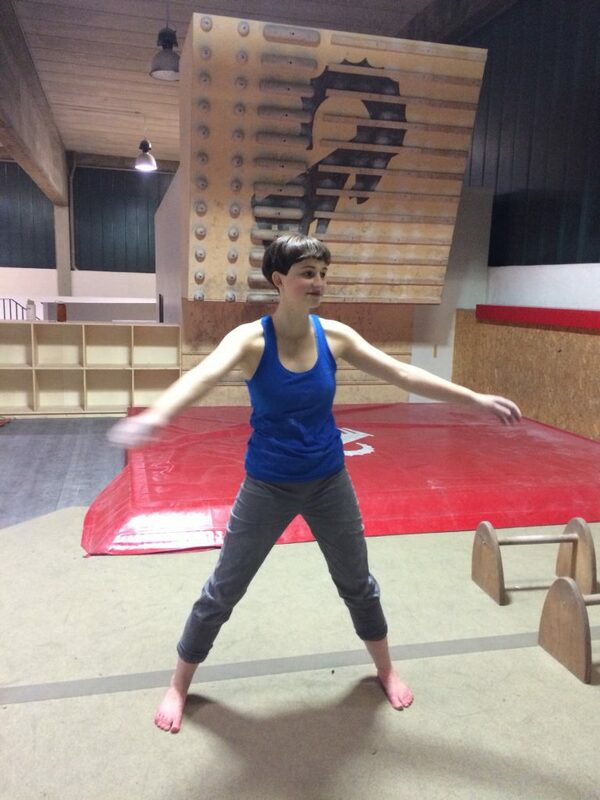 There are 4 key elements that I always include in my warm-up routine before bouldering. Recently, we created a short video for you as I thought a video is more helpful than just seeing photos. Be aware that in the video, I'm not going into explaining what I'm doing and how. It's just showing you how I'm doing my routine. I intend to give you an idea about how you can combine those 4 key elements. Check out the description of the exercises below. Warming up doesn’t just apply to certain muscles but also to our breathing. When our breathing is too shallow, we take in too little oxygen. This makes our energy level drop off. Most of the time, we don’t even realize this and think it’s normal to have low energy because it happens so often. It’s not! Calm down and revert from a high stress level back to a balanced, recharged state. Increase your energy and reach a state in which you can achieve a higher physical performance. For me, jumping rope is a fast and simple way to increase my energy. My routine is 100 fast jumps. If I notice that I can keep going, 200. The Breath of Fire technique generates heat in the abdomen and around the whole upper body (depending on how fast you breathe and how long you do the exercise). When you exhale, pull in your stomach all the way. Traditionally, you only inhale passively, as if you were laughing: You release your stomach and the air flows in through your nose on its own. The exercise is even more effective for me if I stretch my arms upward at an angle (about 45 degrees). This elongates the back and creates even more space in the upper body. This exercise is fantastic, not just for warming up but also for a morning ritual if you have problems waking up. By doing twists and loosening up your shoulders, you can get rid of stiffness in the upper body. Even if you don’t consciously feel stiff, you’ll notice that your upper body is much freer and has more range when climbing. This exercise is simple and incredibly effective at getting rid of tension in the upper body and shoulders. Lena doing this exercise. Even when I’m doing the exercise, I always think of Lena! It was one of our favorite exercises when we were trekking through Patagonia because it would make all the tension in the shoulder-neck area feel as if blown away. Let your arms swing loosely from side to side. Keep your feet firmly anchored to the floor the whole time. Rotate your head along with your upper body as it extends. Stand a little more than hip-width apart. Swing your upper body from side to side along with your arms. Breathe freely or quickly inhale on one side and exhale on the other side. Because it’s dynamic, this exercise is highly effective and not only warms up the shoulders but also the neck. Bend your arms and open them to your sides at shoulder height. Exhale: Bring your arms together in front of your upper body so that your forearms touch. Let your shoulders sink down and relax. Direct your gaze slightly downward and elongate your neck. 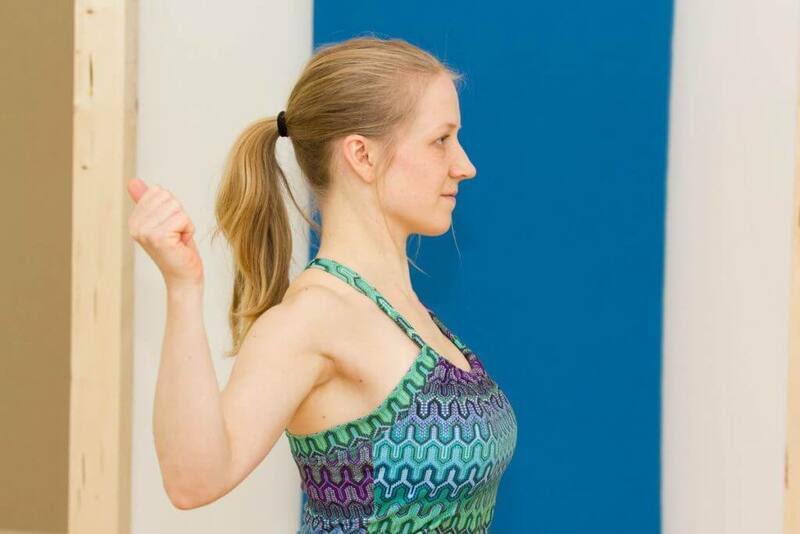 Inhale: Open your bent arms back up to shoulder height. Direct your gaze forward. Remember that the movement comes from the shoulder joint. This will help you actively use your legs during your first bouldering problem. The advantage: You can save your arm strength for the problems that really require it. Stand up straight and lift your heels off the floor. Exhale: Lower yourself down slowly while keeping your heels up. As an added option, stretch your arms upward when you inhale and lower them when you exhale. This exercise is easy to remember and seems very simple at first. If you do the exercise as slowly as you can, you'll realize that it packs a punch. Your core isn’t just your power center – it’s also a key factor in climbing with more body tension. An activated core helps conserve your strength, especially when it comes to overhangs. Boat Pose is quite challenging, and I find that you have to have a knack for it. Especially if your abdominal muscles aren’t strong enough yet, this exercise can put strain on your back because it’s hard to keep it as straight as possible. I find that it works well for me. Sit down and bend your legs. Lift your feet off the floor and stretch your arms forward. Stretch out your body and lower yourself toward the floor, hovering a few inches above the floor with your upper body and legs. I stretch and come back up into the initial position 30 times, then go into a slight Forward Bend to relax my back. 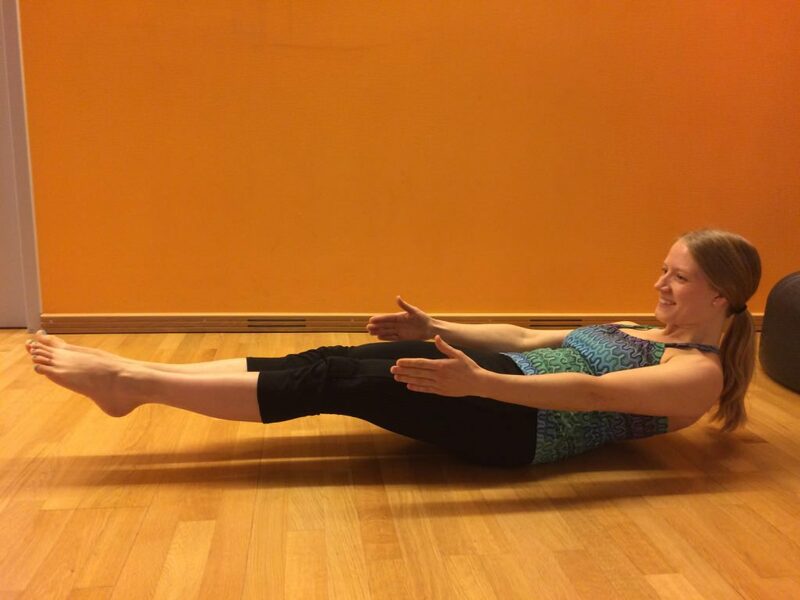 This exercise is also very effective for your core and, in my opinion, more back-friendly. Lie on your back and draw your knees toward you. Then alternate stretching out one leg and the opposite arm, a few centimeters above the ground each time: right leg and left arm, left leg and right arm. The intensity isn’t quite as high when you start out. You’ll really start to feel the effect if instead of just 10 times, you slowly repeat the exercise 30 or 50 times per side, for example. Of course, even with my warm-up routine, there are days when I can’t do as much as on other days. There are many other factors that can enhance or decrease a person’s energy level. For me, warming up acts as a springboard and definitely gives me twice as much energy. With this start-up help, my body is already active and fully ready to climb after a few simple problems, so I can get to the problems that correspond to my difficulty limit more quickly. This experience means that I no longer regard warming up as a tedious "chore," but as a feeling I no longer want to go without.